anthropology – by reading stories about a place, we infer its values, social norms, and culture. Most of the stories are wonderful, uplifting, and show the positive side of Twitter. They are not, I think, your everyday Twitter stories – they are the extraordinary events that stand out in a place’s history. I’m glad someone took the time to document and save them. I remember living through most of them, and it felt great to read these accounts of recent Twitter history. Israel is an excellent story teller, and if I didn’t envy his warm, fluid, friendly, yet clear and simple writing style so much, I’d go on and on praising it :). I loved reading the book, and enjoyed every page of it. 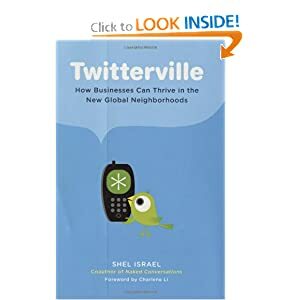 I can imagine critics complaining that the book is overly positive – that it portrays Twitterville as a better place than (they think) it is. Israel’s Twitter enchantment doesn’t bother me, primarily because, like a respectable ethnographer, he spells out his biases clearly and repeatedly. He explains his point of view and enables the reader to decide how to interpret the content. As a qualitative researcher, I do not believe in the myth of objectivity. I think the best we can do is explain our biases, so readers can make informed decisions about interpreting our writing. I see very little of this in popular literature, and I hope more authors will adopt this practice. … and Israel’s enchantment with Twitter doesn’t bother me, because I can relate to it and I share his point of view. I was initially amused by the claim that Twitter can lead to… world peace. But as I read the last chapter, I realized that, as a firm believer in the power of communication to make and break our world, I too, think, that conversation is the best solution – and that it can, indeed, help us make peace.